Tetralogy of Fallot include hypertrophy of right ventricles, pulmonary stenosis, aorta overriding the ventricular septal defect and ventricular septal defect. Tetralogy of Fallot may lead to right to left shunt. Tetralogy of Fallot occur due to unequal distribution and division of the pulmonary artery and aorta as a result of infundibular septum anterosuperior displacement. Tetralogy of fallot is well known for its boot shaped heart which is detected by performing chest x ray. 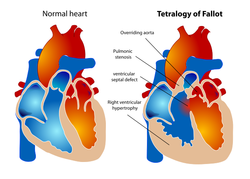 Tetralogy of Fallot fall under the categories of cyanotic heart disease due to right to left shunting and may present with other symptoms and signs such as restlessness and hypercapnia. The aim of the treatment o tetralogy of Fallot is to relief the symptoms by correcting and closing the ventricular septal defect and pulmonary stenosis. 1.VOLINI, ITALO F., and Nathan Flaxman. "TETRALOGY OF FALLOT." Journal of the American Medical Association 111.22 (1938): 2000-2003. 2.Apitz, Christian, Gary D. Webb, and Andrew N. Redington. "Tetralogy of fallot." The Lancet 374.9699 (2009): 1462-1471.